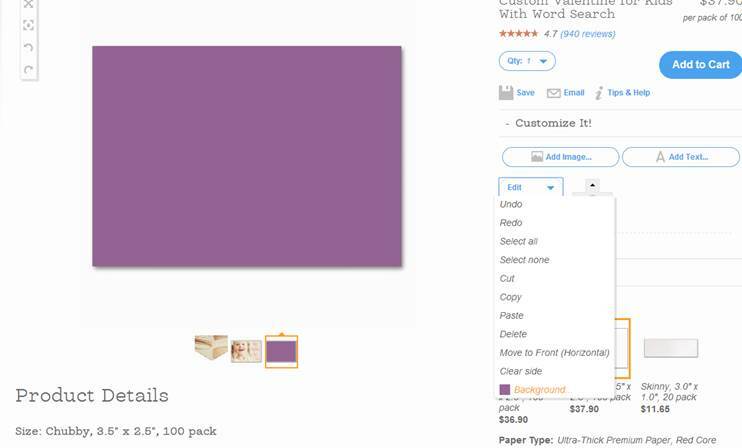 Today’s guest post is from Kelli Agnich – her second post this week – one of our resident merchandising and DIY experts! 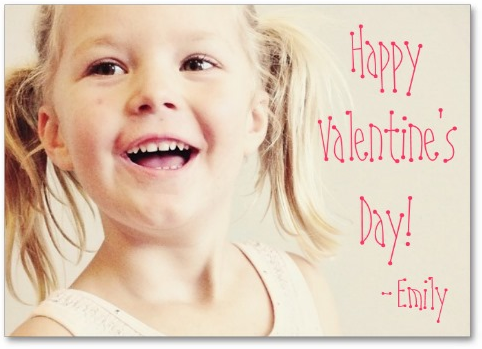 As the mom of 2 little girls, I wanted to find cute Valentines for them to pass out to their classmates and friends. We headed to the drugstore, where I remember going for Valentines as a child, but neither of the girls were super jazzed about the generic card packs there. We ran by a specialty paper store and *I* wasn’t super jazzed about paying the price for high-end (but very cute!) Valentines! 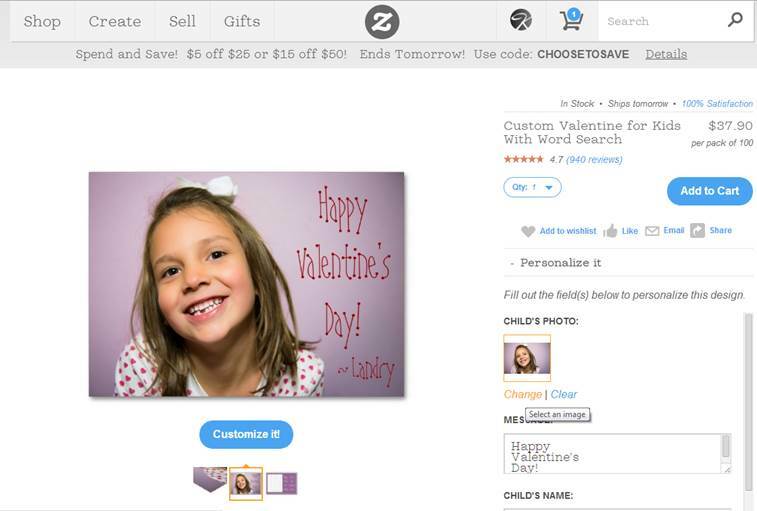 Our solution: let the girls create their own Valentine on Zazzle! 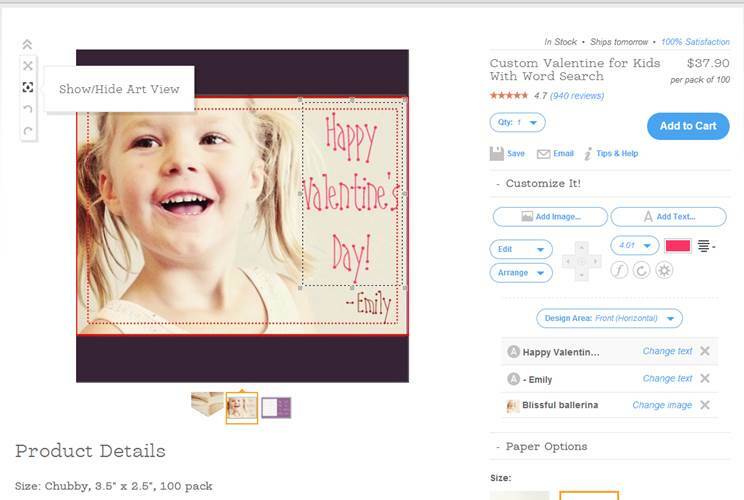 We thought about making a folded card or a postcard, but realized that the Chubby Business Card size was just perfect for fitting in classroom Valentine bags or boxes. The bonus came when we discovered the “Extra-thick” card option so that the feel is substantial and the cards don’t bend easily (think triple thick cardstock weight). The girls were even more excited to find that they could choose a red center for the edge of the card, so we created our design around that! You can start with the basic template for this cute card. 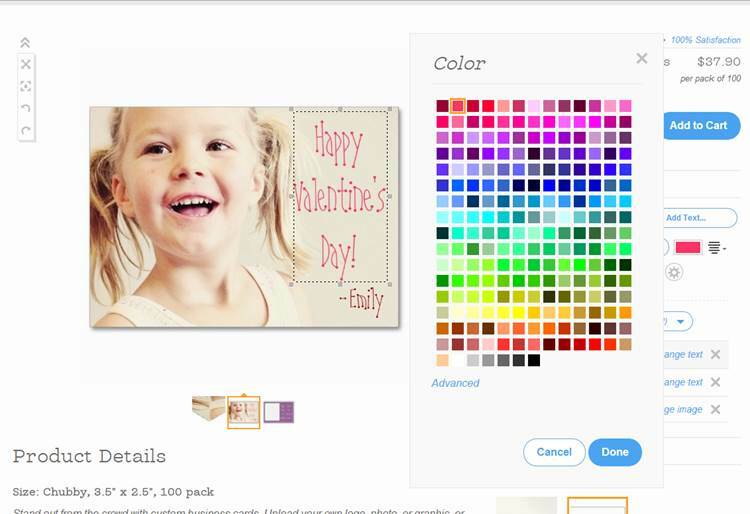 I wanted to upload my daughter Emily’s photo from Instagram, so I clicked “Change” and was able to upload it directly from Instagram with Zazzle’s integrated tool! 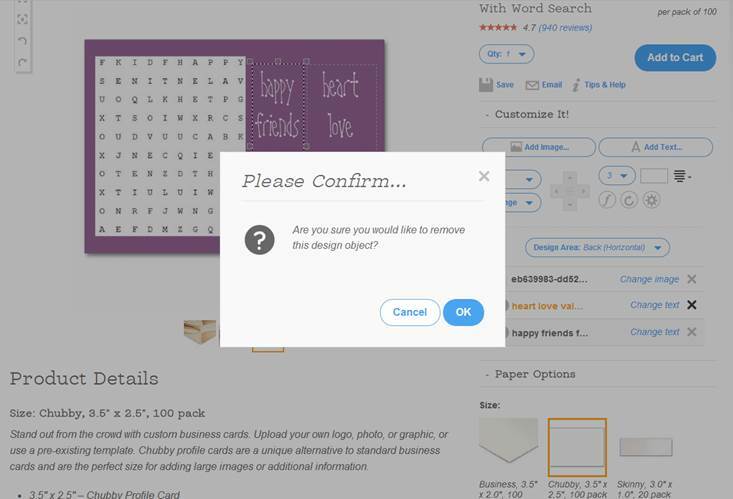 I updated the “Child’s Name” box to read “-Emily” and left the “Happy Valentine’s Day!” message the same per the very specific instructions of my 4 year-old designer. This same 4 year-old decided that she didn’t want the text to be red, so I clicked the blue “Customize It!” button and let her choose the color! We made the text a little bit bigger, so I clicked on the “Show/Hide Art View” icon to check that our text was still within the dotted line border to make sure that it isn’t cut off. 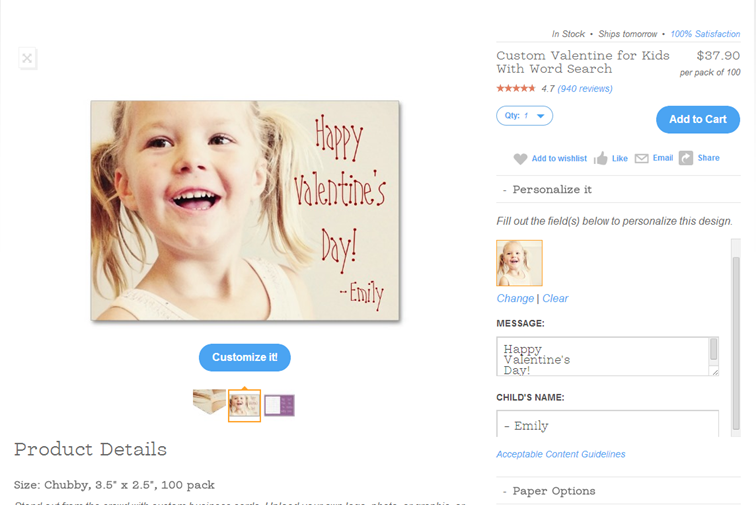 We did the same thing to change the font color for “-Emily” and had ourselves an adorable Valentine front! Because she and her friends are not yet reading, we customized the back by clicking the “X” at the end of each of the 3 design elements. To change the background color, I clicked “Edit” and “Background” at the bottom of the dropdown menu. In the “Paper Options” menu, I selected the “Chubby” size and the “Ultra-Thick Premium Paper, Red Core” type. I love the solid pink back because it’s a perfect space for taping a Valentine’s treat! 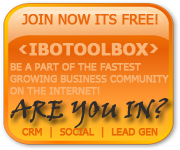 And here is a special discount code for you for 50% off business cards: VDAYBUSINESS. 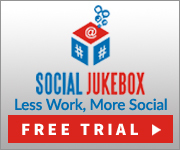 But use it quickly because it expires February 15th!